Where can I find my collections now? 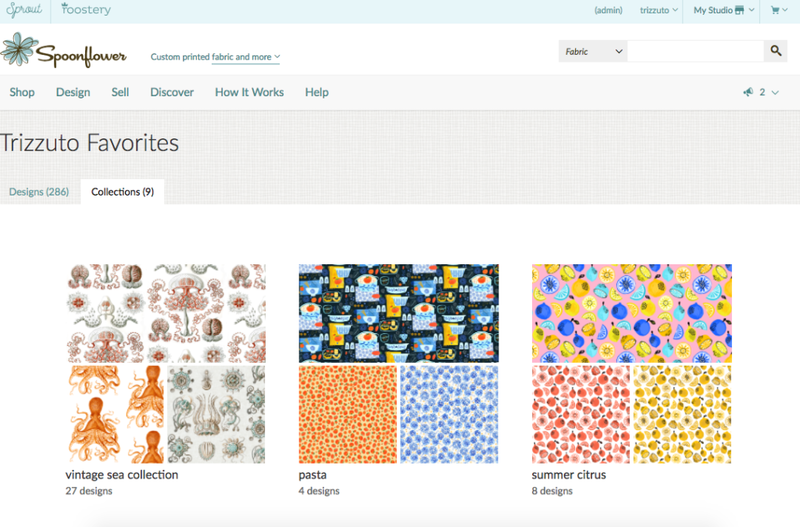 When logged into your Spoonflower account, begin by hovering over My Studio then select Collections. This is the main Collections page where all of your Collections are housed. There you will see two tabs: Designed and Collected. Designed collections are those with only designs by you. 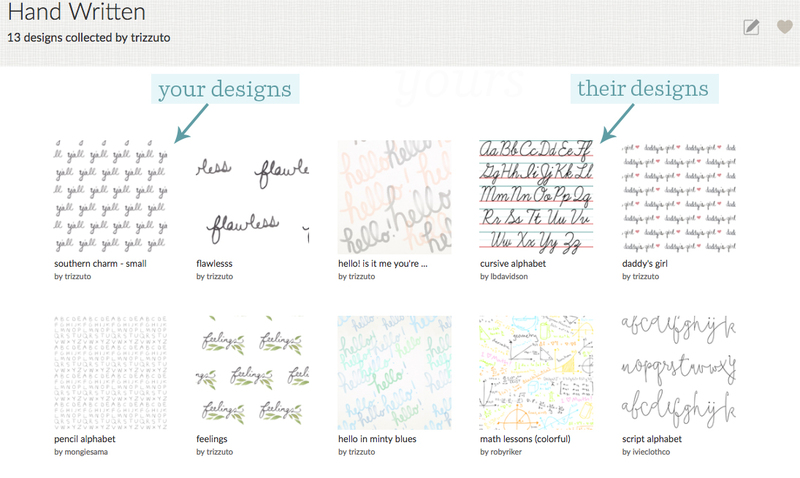 “Collected” designs can be entirely from the Marketplace, or a mix of your own + other designers’ designs. There are now 3 places to view your collections: the collections page described above found under My Studio, the original collections view inside your shop, and in your design library. The Collections page under My Studio will have all collections, sorted into two tabs (Designed, Collected). Only you will see any private collections on that page. The collections in the shop view will only have Designed collections by you alone. 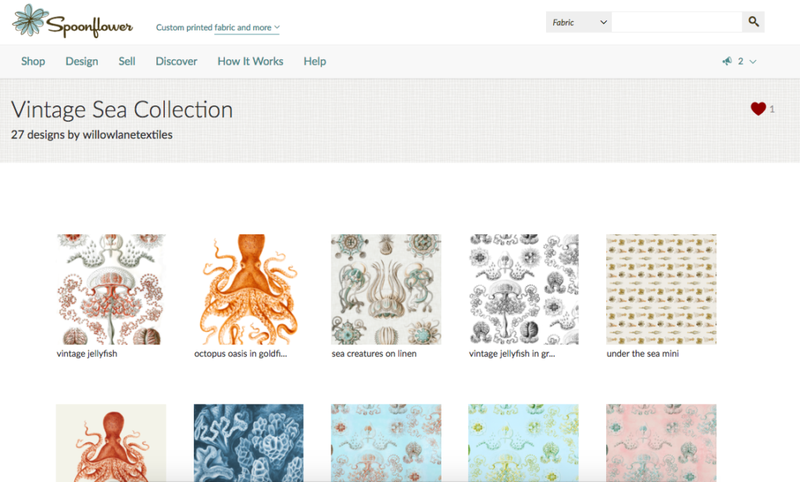 The design library shows only collections containing at least one of your own designs. 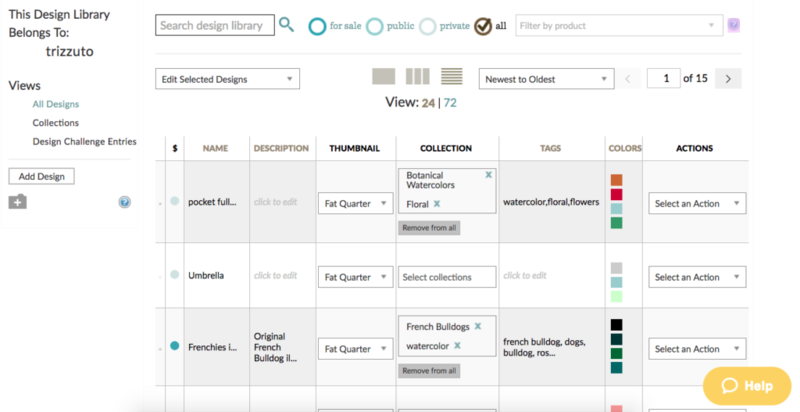 The Collections view from the Design Library shows all collections containing at least 1 of your own designs. You can also create a new collection here. How do I start a brand new collection? There are a few ways to start a new collection. 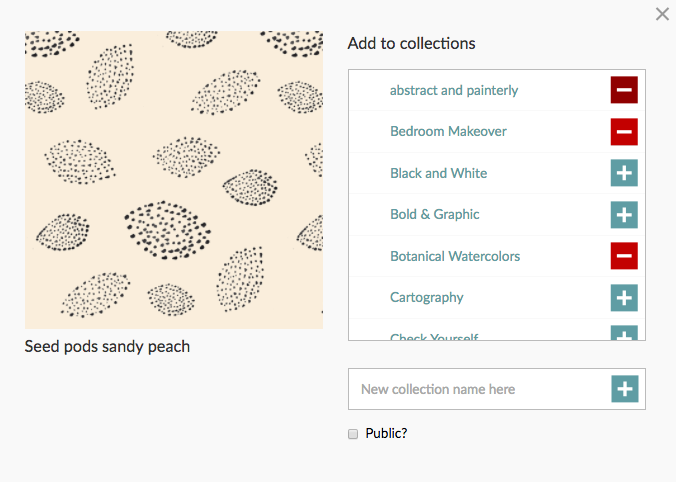 The newest way that’s just been added, is by hovering over My Studio, then going down to the Collections page. In the upper left, you should see the option to add a new collection. The light gray boxes indicate empty slots in a collection. 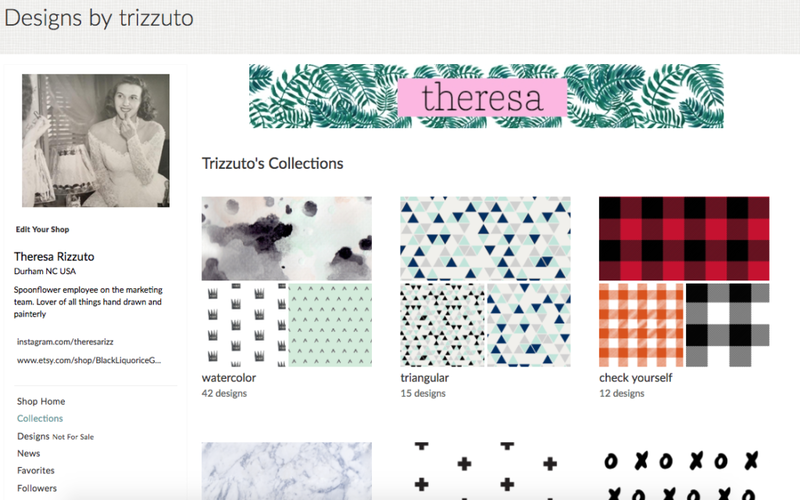 Organize your favorite designs by different designers into one single themed board. 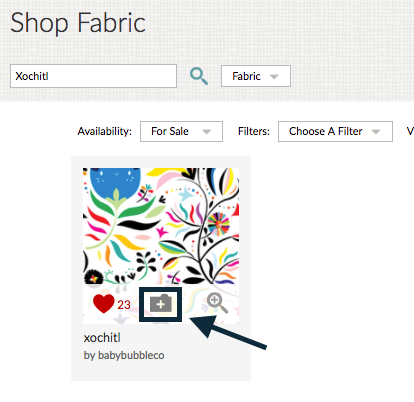 While browsing the Marketplace, you can create a Collection by hovering over a design and clicking the folder icon next to the favorite (heart) icon or start from the Collections link under My Studio to begin your theme. You’ll see the collections you already have listed. Or if you’re starting a brand new collection, just type in the ‘New collection name here’ field to create a new collection on the spot! I already have a few collections created, which is what you see here under “Add to Collections.” To start a new collection, just type the name you want into the text field and hit the “plus” icon. The red box with a “minus” icon indicates you have added the design to the collection successfully. Add one design to as many collections as you want! Make your Collections public (searchable by others) or private. Do you want to show your curation skills to the world or make a shoppable wishlist? Make your Collection public! Throwing a surprise party for a friend? Just keep it private. 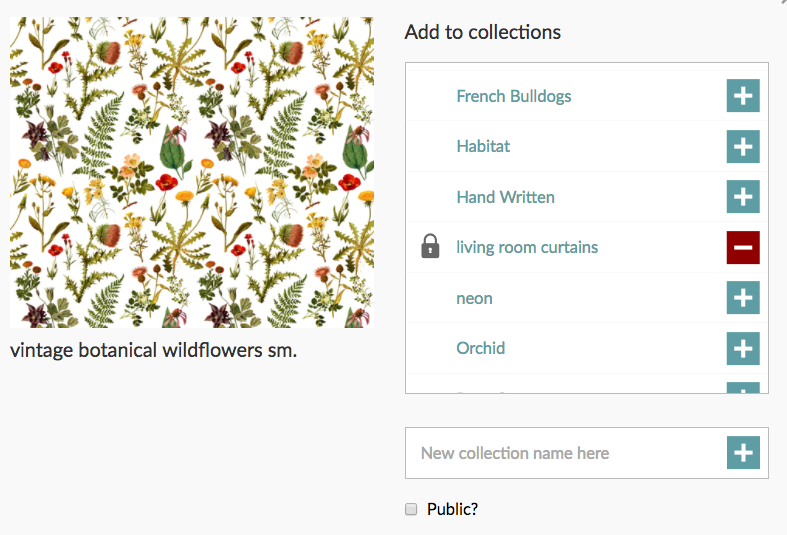 To change a collection from private to public, just edit the design, click on the “public” box and hit update. 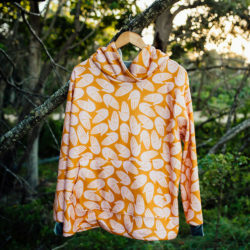 Want to add more than 30 designs to a Collection? Now you can! Plus you can have the same design in multiple Collections. Curate away to your heart’s content. Look! A shiny new Collection block! 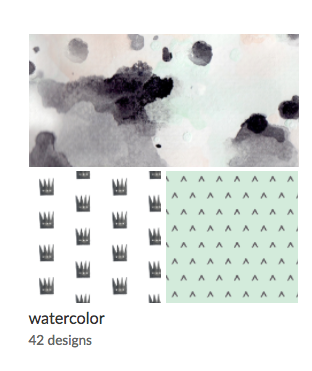 Each Collection now features one large design over two smaller thumbnails. We pre-populate these from your Collection automatically based on your public designs, but you can customize it by assigning order to three designs. Once you click into a collection, you’ll see these cover designs first. After that, designs will show up in the order that you add them, with the most recent ones at the top. 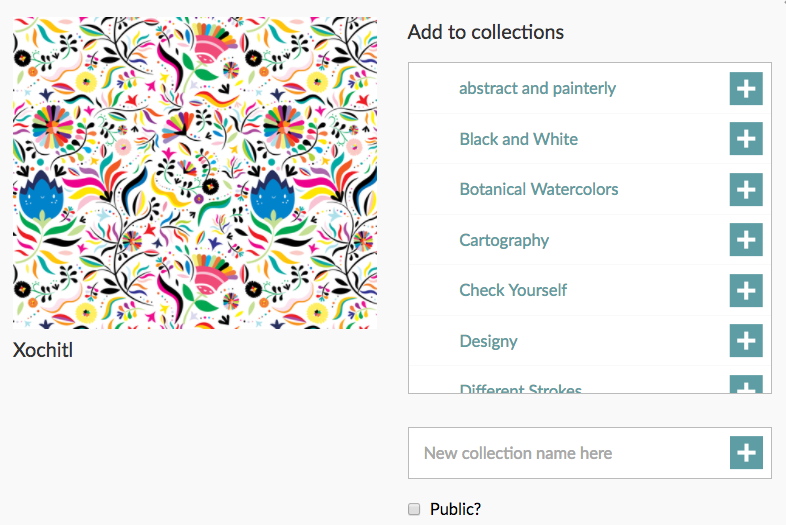 Select the three designs you would like to show as your collection cover. These should be the 3 designs you feel best represent the collection, as they’ll be the first thing a customer sees when browsing through your collections. 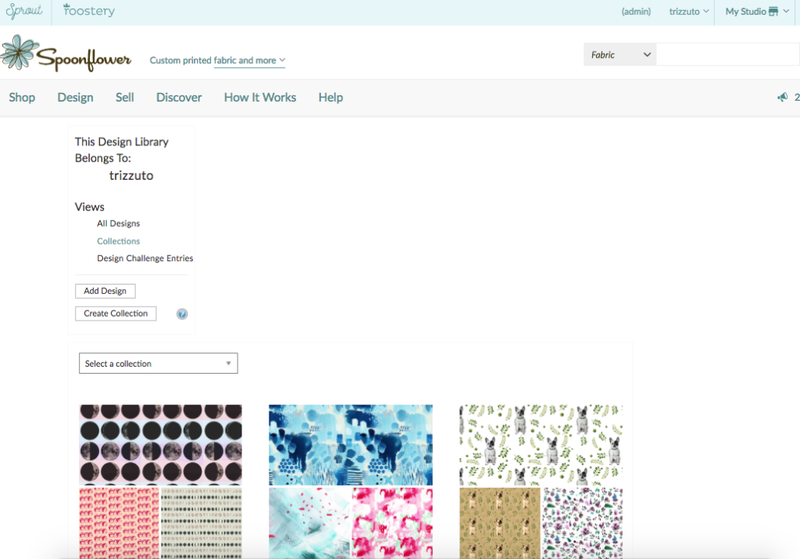 Organize and create collections based on sewing projects, styles, themes, applications, anything! 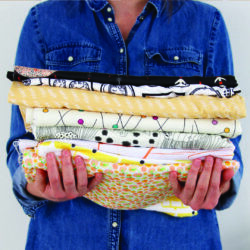 Keep your inspiration and sewing projects organized, plus see how different designs look together to gauge cohesion before ordering swatches. As a designer, you can easily make batch edits to your designs by going to the “list” view. Select the designs you would like to edit, then choose an action. 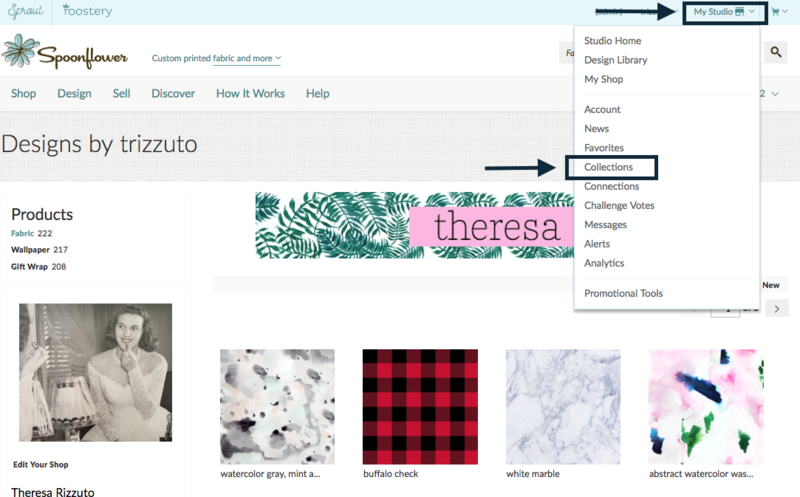 Add designs to collections easily in this view by simply typing in the collection you want to select under the COLLECTION category at the top. Do the same under the TAGS category, typing out the tags you want to add, separating them by commas. 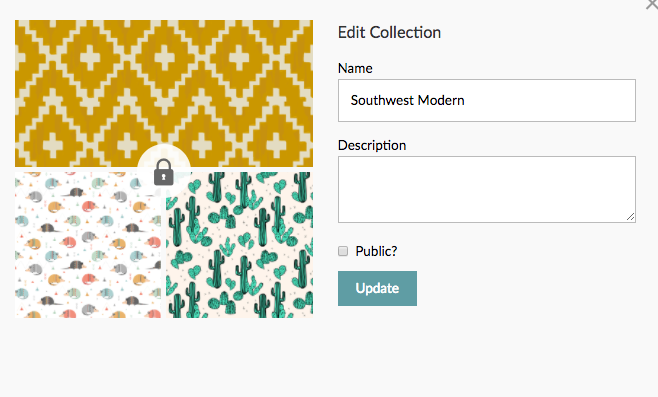 Did you know that you now have the option to not only favorite design, but to favorite collections as well? Just click on the heart in the upper right that appears after you click into a collection. Find your “favorited” collections on your favorites page under the Collections tab. *A special note for designers: swatch samplers can still accommodate just 30 designs or less, and will pull from the first 30 in a collection. 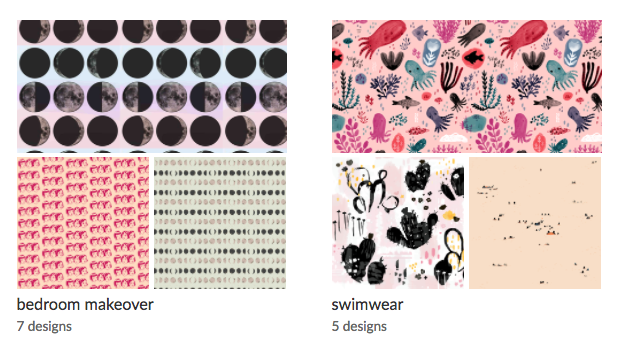 You cannot purchase samplers of collections that include designs by others (not your own.) So if you have a collection of your designs that does contain more than 30, you will need to separate it out into 2 collections before ordering samplers. So what are you waiting for? 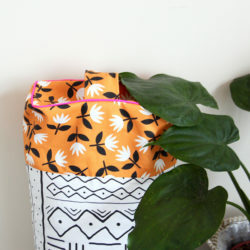 Come on over and make a new Collection! Wow! Really great feature. 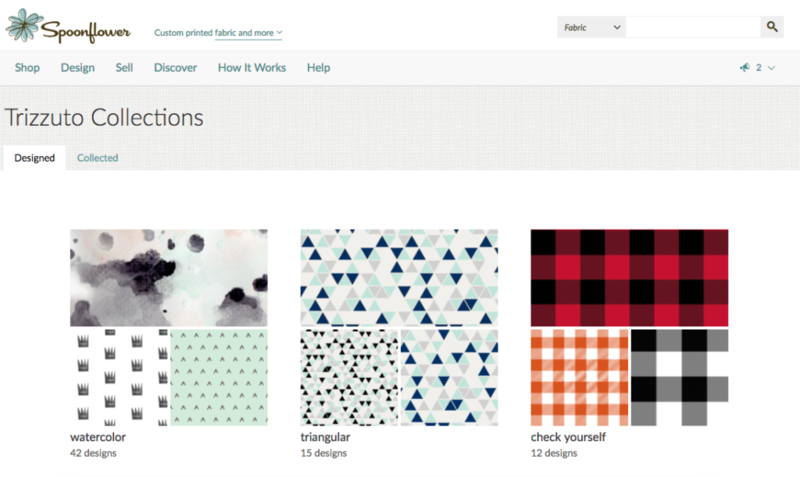 I love how Spoonflower is always improving and listens to the community. Thanks Spoonflower team! Whee! 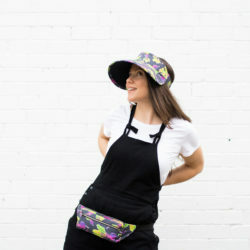 This should be a great help, not just for designers who have oodles of one type of design (so many plaids, so many), but for folks who only wish to shop here, and would like to compare designs before deciding which suit their needs. I am not finding the button to purchase the swatch samplers in my collections. Can anyone help? Hey Gail, as long as the collection has 100% your designs, and there are 30 or less, you should see the option to purchase a swatch sampler. To do so, head to your “Design Library” under “My Studio”, then go to “Collections.” From there, select a collection that features just your own designs. In the upper right, you should see a “get a sampler” button. A suggestion: Change the red/minus icon to a green check mark. That feels like a more intuitive way to express the fact that a design has been successfully added to a collection. The minus sign would seem better suited to stand for a “remove from collection” option. This new “act” of collection building is truly addicting, in a good way :)! I would love to be able to build a private collection and invite friends/collaborators to be able to view it before sharing it with the public. For example if someone was designing a print collection for a maker/sewer or even an interior designer – this would be a great selling/presentation tool.